Custom Dining Place Mats Printed in Bulk Promotional, Very Inexpensive. 16-3/4" x 10-3/4". Budget Prices in the USA and Canada. Wholesale Custom Printed Dining Placemats at bargain prices. Made of standard 50 Lb. Titanium White stock. Free 2 Color Imprint. Any combination of standard colors: Black, Blue (293), Burgundy (201), Green (347), Orange (021), Red (185) or Reflex Blue. 16 3/4" L x 10 3/4" WLowest cost in North America. Free Artwork Design. American Clients pay no taxes. The unit prices below include you custom imprint in 2 colors. 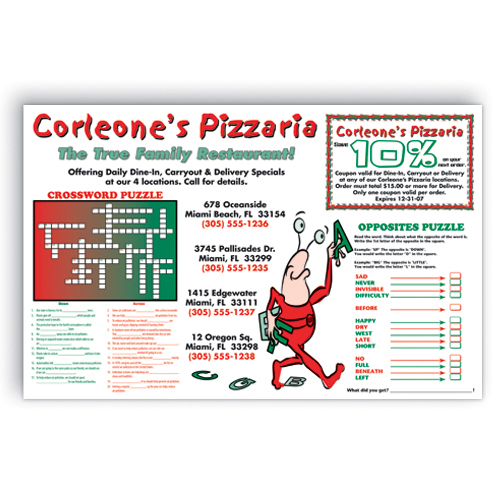 Full color placemats are also available for a minimum quantity of 10,000.. Contact us for quote. • Custom Printed Dining Placemats can add to the theme or enviroment of any celebration, event or restaurant! • Free 2 Color Imprint - Any combination of standard colors: Black, Blue (293), Burgandy (201), Green (347), Orange (021), Red (185), Reflex Blue. Standard stock: 50 lb. White paper. Imprint Area: 16 1/4" x 10 1/4"
Approx. Dimensions: 16 3/4" x 10 3/4"